The National School Lunch Act was passed in 1946 after an alarming number of World War II draftees turned up too malnourished to serve. The Los Angeles Unified School District has followed strict nutritional guidelines for its 712 cafeterias ever since, dishing out more than 700,000 meals per day that range from pupusas to calzones. Grab a fork—your teriyaki chicken awaits. The LAUSD is ambitious about purchasing produce from local farms. In 2013, it spent 75 percent of its annual $20 million produce budget on sources around the state, up significantly from 9 percent in 2011. The apples are distributed by Ontario’s Gold Star Foods, about 50 miles from downtown L.A. Sorry, chocolate milk lovers: The LAUSD did away with flavored milks in 2011 (and also cut back on sugary juices). But milk is still a 1940s-era mandatory item, so kids sip their choice of low-fat, fat-free, or lactose-free milk from Driftwood Dairy. Soy milk is also available. Each two-ounce portion of cooked, chopped chicken breast is splashed with low-sodium teriyaki sauce and placed atop one cup of brown rice. In accordance with a mandate for more healthful food, fried chicken was expelled from the menu in 2011. 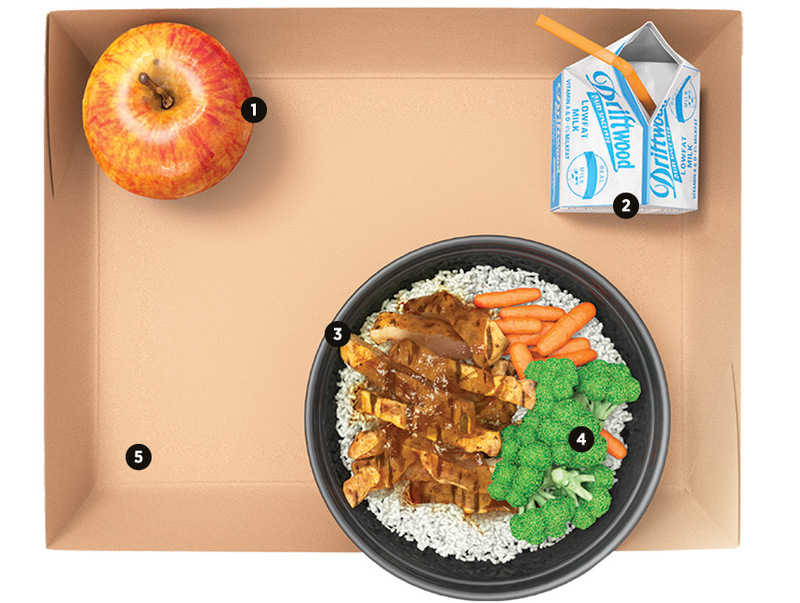 Lunch offerings must feature fresh veggies, and students must select at least one vegetable or fruit per meal as part of the original federal law. Broccoli and carrots from regional farms round out this bowl. In 2012, the district swapped out environmentally unfriendly Styrofoam packaging in favor of five-by-ten-inch containers made from natural fibers and recycled cardboard.